Context. 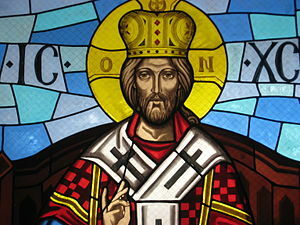 Here on the last Sunday of Ordinary Time the Church celebrates Christ the King Sunday. The title is given several places in Scripture: king of ages (1 Timothy 1:17), King of Israel (John 1:49), King of the Jews (Mt. 27:11), King of kings (1 Tim 6:15; Rev. 19:16), King of the nations (Book of Revelation 15:3) and ruler of the kings of the Earth (Rev. 1:5). The solemnity has been celebrated on the Roman calendar since 1925 and was instituted as a culmination of the liturgical year and a reminder that in His suffering and death, Christ ascended to his throne. Kings and Kingdoms. An oft used phrase in Luke, he basileia tou theou (the kingdom of God), is a difficult phrase to understand. How should it be translated? basileia can refer to the area ruled by a king. So phrases such as “entering the kingdom” (Luke 18:17, 24, 25) may be understood as coming to the region controlled by the king — or entering the heavenly realm as the “kingdom of God”. It is clear in Luke that the basileia of God refers to the second meaning. It is not something that can be seen (17:20). It is something within us (17:21). It is something proclaimed or preached (4:43; 8:1; 9:2, 60; 16:16). It contains secrets (8:10), but it can be sought (12:31) and given as a gift (12:32) and received (18:17). The kingdom comes near (10:9, 11; 21:31). All of these references make better sense if the kingdom is defined as “God’s power to rule over us” rather than “a place where God rules”. The Crucifixion as a Moment of Discipleship. The gospel reading is from the Crucifixion. Joel Green (Gospel of Luke, 744) provides a clear context for the suffering and death of Jesus, couched in the idea of the growing conflict that has been so evident in the Holy Week encounters with the authorities in Jerusalem – a conflict that was indicated even at the earliest stages of Luke’s gospel. Luke’s narrative of Jesus’ suffering and death is inexorably linked to the earlier chapters of the Third Gospel by the development of numerous motifs, the most pervasive and important of which is the motif of conflict. Conflict, too, has been a primary force driving the narrative plot forward to this point. Jesus, according to Simeon, was to be the cause of division within Israel (2:34); as Luke has narrated it, division has surfaced as the divine purpose has been disclosed, first in the ministry of John (who was subsequently imprisoned [see 3:18-20] and beheaded [see 9:7-9]), then in the ministry of Jesus. The propagation of the “good news” has attracted both allies and opposition, with some persons working to embrace and serve the divine project, others to reject and obstruct it. Both in anticipation (e.g., 13:31-35) and in reality (19:29-21:38) Jerusalem has been a place of conflict. Jerusalem is the center of the Jewish leadership (Pharisees, Sadducees, scribes, et. al.) which has consistently opposed Jesus (e.g., 19:45-48; 20:9-19)and thus has take a position against the purpose of God. The gospel has been a call to discipleship – and thus a time to “takes sides.” On the one hand is Jesus together with Jesus’ disciples and “the people,” who have responded to the coming of God’s reign in the person of Jesus. On the other are the Jewish leaders in Jerusalem, as well as the devil. As Green points out (Gospel of Luke, 475) Luke’s narration has repeatedly established the important place of “the people” as a buffer between Jesus and his opposition (cf. 19:47-48; 20:19) — a barrier that must now be breached if the Jerusalem leadership is to have its way with him. One need not look far for hints that this barrier is penetrable, since those closest to Jesus, the disciples, have been known to falter in their understanding and support of Jesus (e.g., 9:46-50; 18:15-17, 31-34); indeed, we have known for some time that one of them would become a traitor (6:17). Moreover, Jesus had only just predicted with reference to his followers, “You will even be handed over by parents, brothers, relatives, and friends, and they will put some of you to death” (21:16). If this is the destiny of the followers, what of the one whom they follow? In fact, the Lukan account of Jesus’ passion and death is in part the story of unholy alliances made and unmade, as this barrier is repeatedly, if only temporarily, breached. Satan and the Jerusalem leadership are allied in their opposition to Jesus (22:53), and it is through diabolic influence that one of the twelve, Judas, sides with the leadership against Jesus (22:3-6, 47-48). Judas is not alone, however. In their anxiety over relative honor and status at the table (22:24), all of the disciples participate in behavior reminiscent of that of the Jewish leadership (e.g., 20:45-21:4). Peter comes dangerously close to siding with Jesus’ opponents, and he ends up denying his Lord three times (22:54-60). If Luke narrates the inconstancy of the disciples, though, he also recounts their eventual separation from those who oppose Jesus — first in the case of Peter (22:61-62), then in the case of the others (23:49). The only exception is Judas, whose place among the twelve must be filled by another (Acts 1:15-26). Here resides the great irony of the conflict that weaves its way through the Third Gospel and reaches its climax in the Lukan passion narrative: Those who oppose Jesus believe themselves to be serving God, yet unwittingly serve a diabolic aim. Throughout his ministry, Jesus has, from their perspective, departed from the demands of Torah and set himself over against what had become not only unquestioned but also unquestionable practices by which one demonstrates one’s obedience to Yahweh. Again from their perspective, Jesus’ attempt to claim the temple for an alternative agenda was perverse; his teaching had resulted in the dislegitimation of the temple authorities and even the relativizing of the temple itself within the divine plan. The charges on which the Jewish leadership have him arraigned before Pilate essentially involve his identification as a false prophet who, on account of his popular following, poses a threat to Rome (23:1-5). Throughout his ministry, Jesus has been involved in a war of interpretation: Who understands and serves the divine aim, really? Who interprets and embodies the divine word, really? Because both Jerusalem authorities and Jesus see themselves as acting on behalf of the divine will, the actions that unfold in chs. 22-23 are indeed tragic. They are, nonetheless, the fullest manifestation of the competing aims at work in the Gospel narrative. previously seen best in the temptation of Jesus in the wilderness (4: l -13). The making and unmaking of unholy alliances are symptomatic of how, in the face of hostility, people can be tested in their commitments. This is particularly true on account of the evidence Luke provides for the presence of Satan behind and through those who oppose the redemptive aim of God. One is immediately reminded of Jesus’ eschatological discourse, just delivered (21:5-36), with its admonitions to prayer and faithful vigilance. Luke’s readers are thus encouraged to find in Jesus an exemplar of proper response in the face of trial and persecution. He is the model for disciples to follow. Here on Golgotha, where the fullness of God’s glory is revealed, we are people among the crowd who are called to choose a side – and to live out the consequences of our choice. This entry was posted in Catholic, Sunday Morning and tagged Christ the King, crucifixion, discipleship by Friar Musings. Bookmark the permalink.